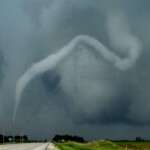 The process by which a tornado develops is complex and requires a lot of variables to come together at the same time. The following provides a summary of the process we go through on a daily basis and what we look for to see the final tornado form in front of our eyes. Find out ALL the details and see it happen for yourself! To give you an idea of our typical day on the tour, check out some of these time-lapse videos . Several of these days brought us big tornadoes! Our daily ritual always begins with the morning forecast. Our on-board meteorologists will look at the current conditions across the central plains and then we look into the future to find out where the best chance for tornadoes will be later that day. F5! feels the key ingredient to tornadic development is upper level support, or super-fast winds in the upper levels of the atmospshere. Although tornadoes can form without strong upper level support, we look for this key ingredient to increase the chances of tornado viewing later in the day. After a complete analysis and forecast is produced each morning, that day’s “Target City” is announced. The first sign of tornado development comes out of the clear blue sky. 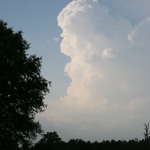 When the conditions are right for thunderstorm development, the first cloud we see is a puffy cumulus cloud. These types of clouds are very common across the country, but typically they do not grow into monster thunderstorms that drop tornadoes. For that, you need much stronger instability in the atmosphere. The setup in the central portion of the United States, known as “tornado alley,” is perfect during the spring months as cold, dry air moves south out of Canada and the warm, moist air moves north from the Gulf of Mexico. 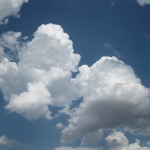 As the two air masses clash, the atmosphere becomes even more unstable, meaning the parcels of air in a certain area become more buoyant than the surrounding air, so the cumulus clouds begin building vertically. We call these towering cumulus, or TCu. Since all clouds require upward moving air, you can imagine that a TCu requires even faster moving air to allow it to shoot up that quickly, often rising hundreds of feet in less than 20 minutes. Usually we’ll see several TCu’s building around our target city in the afternoon hours. The next step is to find the best updraft to begin inspecting more closely. As the towering cumulus clouds continue to grow, they begin to bulk up and, with luck, turn into supercell thunderstorms. 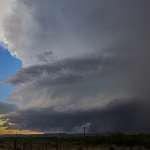 Although only a small number of cumulus clouds or towering cumulus clouds become supercells, we look for supercells to increase our chance of witnessing a tornado. Supercells are the perfect parent thunderstorms for tornadoes because they already include strong updrafts that often are rotating. A supercell thunderstorm develops its own complete system with an updraft and a downdraft, which provides a nice generator for tornadoes. These supercell thunderstorms are responsible for most of the tornadoes that drop in any given year. As the supercell continues to churn, we watch for a lowering under the updraft, where the updraft becomes more focused and drops closer to the earth. This visual representation of a tighter updraft is called a wall cloud. Updrafts in supercells typically rotate, but wall clouds always rotate. The tornado will then drop out of the wall cloud. 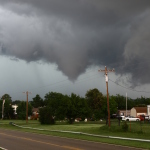 However, we have witnessed several occasions where a tornado drops out of the updraft right next to the wall cloud! Every storm is different, so this is not a hard and fast rule, but typically, the tornado will drop out of a wall cloud. A tornado is a connection from the earth all the way into the upper levels of the atmopshere and the stronger the upper level support (jet stream), the more potential for a larger and more destructive tornado. After dropping to the ground for an average of a few minutes, most tornadoes will begin to die in what we call the roping out phase. Rather than simply disappearing, tornadoes will typically rope out and dissipate under the thunderstorm. As we mentioned, there are many ways tornadoes can form and dissipate, but the typical situation is as outlined above. The best way to understand the process of tornado development is to join our tour and witness it yourself–with a full education from our meteorologists! Any questions you have will be answered and you’ll be able to watch the next tornado touchdown along with the experts!